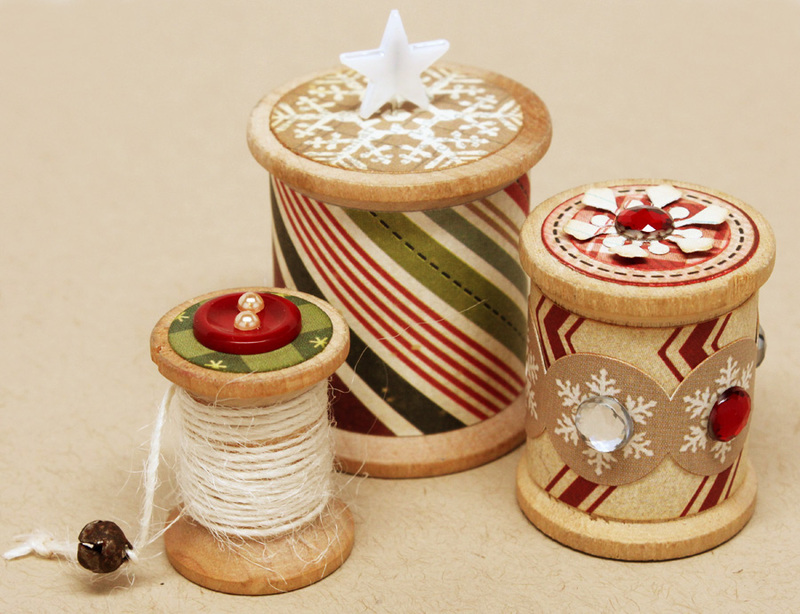 Today's ornament(s) is another super easy set of altered wooden spools. I got my spools at a garage sale, but you can also get them at the craft store in the wood aisle. You'll need three sizes of wooden spools, patterned paper, circle punches, button, pearls, gems, star pin, twine, a tiny jingle bell and a snowflake punch. Cover the main body of your large and medium spools with patterned paper. Wrap a length of twine around the smallest spool, slide on a small jingle bell and tie off the tail in a knot. Measure the diameter of the tops of each spool and punch/cut circles slightly smaller. Cover the top of each spool with the patterned circles. On the large spool, slide a star pin into the center. On the medium spool, punch out snowflake circles and glue them around the center of the spool. Add a gem in the center of each snowflake. Punch out a small paper snowflake and glue it to the top of the spool. Add a gem to the center. On the small spool, glue a button to the top and cover the button holes with pearl gems. That's it -- super easy! To make them hanging ornaments, before covering the tops of each spool with a paper circle, punch a small hole in the center of each circle. Cut an 8" piece of twine, fold it in half, and thread the two open ends through the hole. Tape it off underneath, then glue the circle to the top of the spool. Don't forget to stop by SCT's blog for your chance to win another amazing prize! These are very cute and would make a special gift to a fellow sewer or quilter. 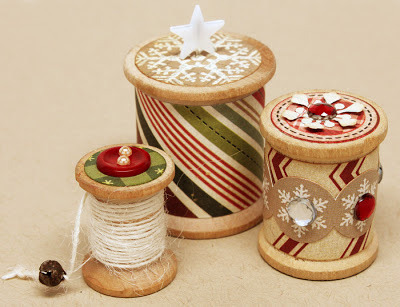 love all xmas things that look vintage...my stores never have spools like this though! Maybe I need to take a "junkin" road trip this summer! Another beautiful idea, Becky! Thanks for the great photos and tutorial! I saved my Mother's wooden spools--now I have a purpose for them. Thank You for the idea. All your decorations are so cute. These are the cutest little things! Going to go make some right now! So far I've made all of them. I'll have to check and see If I have any of these. Very festive!